The State’s case is that the transaction was “done at the behest of Mr Lowry”. A FORMER CEO of a Finnish refrigeration company has told a jury that his company had “an agency agreement” to pay commission to Michael Lowry’s company for Irish sales. Giving evidence from Finland via video-link, Fred Ramberg agreed with Remy Farrell SC, prosecuting that if his company, Norpe Oy, supplied to a retail outlet in Ireland, a commission would be paid to Streamline, the trading name for Lowry’s company Garuda Ltd. The witness agreed with counsel that an agency agreement, signed by both he and Lowry on 1 November 1997, outlined in the “terms of agreement” that the agent should be entitled to a commission of 5% on all sales. Ramberg agreed that it stated that the agreement was between Norpe OY and Michael Lowry but that Lowry’s name was crossed out and handwritten in its place was Glebe Trust, with an address in the Isle of Man. He agreed that he had written in the change and had initialled it but was not able to indicate when he did this, “I’m not sure. I guess 2008” before he confirmed that he had “no clue” who Glebe Trust are. Michael O’Higgins SC, defending Lowry, told Ramberg that his client claims he was on holidays in Spain in August 2002 when a person he owed money to put him under pressure to pay it. He said that Lowry then contacted Ramberg and asked that the commission owed to him be paid directly to this man. “I’m not aware,” Ramberg replied. The statement of an interview of Stella Lipponen, who worked in the accounts department with Norpe from October 2001, with the Finish police, was then read to the jury. She confirmed a payment of €388,788.12 was paid on 28 August 2002 and that the payee referred to was Glebe Trust. She told officers she didn’t know why the account ledger displayed a different payee. Lowry (61) of Glenreigh, Holycross, Co Tipperary earlier pleaded not guilty at Dublin Circuit Criminal Court to four charges of filing incorrect tax returns on dates between August 2002 and August 2007 in relation to a sum of £248,624 received by his company, Garuda Ltd and one charge in relation to failing to keep a proper set of accounts on dates between 28 August 2002 and 3 August 2007. He further pleaded not guilty on behalf of Garuda Ltd to three similar charges in relation to the company’s tax affairs and one charge of failing to keep a proper set of accounts on the same dates. It is the State’s case that Mr Lowry’s company received £248,624 in commission from Norpe OY in August 2002. It is alleged that Lowry arranged for this payment to be made to a third party, residing in the Isle of Man, and therefore it didn’t appear in the company accounts for that year nor did he declare it as income. It is further alleged that the accounts were then falsified in 2007 to reflect that the payment was received in 2006. “It was the accountant’s version of re-fried beans. The books are cooked in 2002, a sum of money is kept off the books and in 2007, the 2006 books are cooked again to bring the money in without drawing attention to it,” Remy Farrell SC, told the jury in his opening address. Farrell told the jury that it is the State’s case that a sum of £248,624 received by Lowry’s company and not declared to Revenue, “would have amounted to 88% of the company’s certified gross profits for the year”. The trial continues before Judge Martin Nolan and jury of eight men and four women. Email “State prosecutor says TD Michael Lowry and his company 'cooked the books'”. 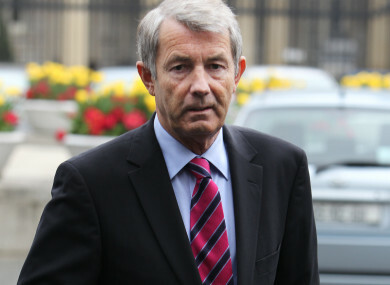 Feedback on “State prosecutor says TD Michael Lowry and his company 'cooked the books'”.